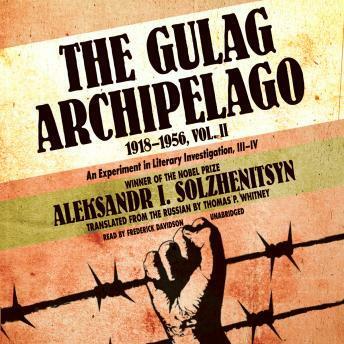 This second volume in Solzhenitsyn’s narrative chronicles the appalling inhumanity of the Soviets’ “destructive-labor camps” and the fate of prisoners in them—felling timber, building canals and railroads, and mining gold without equipment or adequate food and clothing, and subject always to the caprices of the camp authorities. Most tragic of all is the life of the women prisoners and the luckless children they bear. Once again, this chronicle of appalling inhumanity is made endurable by the vitality and emotional range of the writing. In one truly remarkable chapter, a parody of an anthropological treatise, Solzhenitsyn achieves new heights of sardonic wit. In the final section the music changes, and he provides a magnificent coda on the possibilities of redemption and purification through suffering. Named a Time Magazine Best Nonfiction Book of the Twentieth Century. National Review's 100 Best Nonfiction Books of the Century.